Word through the forex grapevine is that the U.S. government is moving closer to a potential shutdown this week if Congress fails to pass legislation for additional funding. Now this isn’t the first time that the folks over at Capitol Hill have stirred this much trouble in Washington nor is it the only instance that the situation has reached the eleventh hour, so let’s take a walk down memory lane to see how it affected the dollar’s forex price action in the past. What the heck is a government shutdown anyway?! 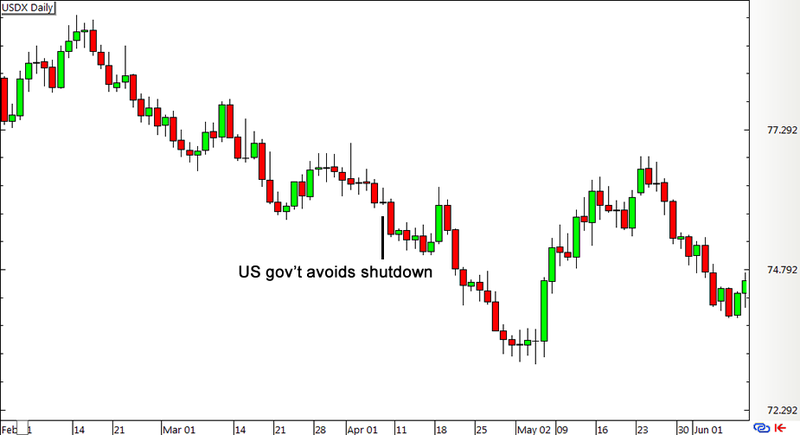 For the forex newbies just tuning in, a government shutdown is exactly what the term implies so you can bet that this situation would have an impact on the U.S. economy. Wikipedia defines it as “a situation in which the government stops providing all but essential services” such as crime prevention, fire fighting, or weather forecasting. It is actually up to the Office of Budget and Management to draw the line between essential and non-essential services, although it is likely that national parks and some minor government offices will be closed. This means that close to 40% of federal employees would be forced to take an indefinite unpaid leave while workers who aren’t furloughed will probably receive their salaries only after the shutdown ends, possibly putting a bit of a dent on consumer spending during that period. What happened during earlier government shutdowns? A couple of years back, the U.S. government was shut down for half a month due to the lawmakers’ bickering over the Affordable Care Act a.k.a. Obamacare. House Republicans wanted to delay this legislation in order to trim healthcare spending and reduce the budget deficit but Senate Democrats kept rejecting their proposals. At that time, the U.S. government was on the verge of hitting its debt ceiling and possibly defaulting on its obligations. Approximately 800,000 government employees were furloughed then and another 1.3 million workers were required to report to work without any guarantees on when they’d receive their salaries. Thanks to a last-minute vote by lawmakers to move the debt limit, the shutdown ended after 16 days but analysts estimated that it still shaved off around 0.6% of the country’s GDP during Q4 2013. Prior to this, the U.S. government was also shut down during the Clinton administration in the 90s when government services were suspended for a total of 27 days, dragging the country’s GDP down by approximately 1% back then. What might happen this time? U.S. lawmakers are still bickering and not showing any willingness to compromise when it comes to government spending on Planned Parenthood, but resigning House Speaker John Boehner assured that the House would pass the necessary funding bill now moving through Senate. With that, there’s still a chance for the U.S. government to narrowly avoid a shutdown – a scenario that took place back in 2011. At that time, Republicans and Democrats had been able to call a truce to cut federal spending by 38 billion USD for the next six months just hours before the debt deadline. Keep in mind, however, that a government shutdown by September 30 onwards MIGHT mean that the NFP report won’t be released by Friday. How might this affect the dollar’s forex action? Based on the movement of the dollar index back in 2011 and 2013, it seems that the currency reacted mostly to risk sentiment and actually banked on its safe-haven appeal when the government was shut down. 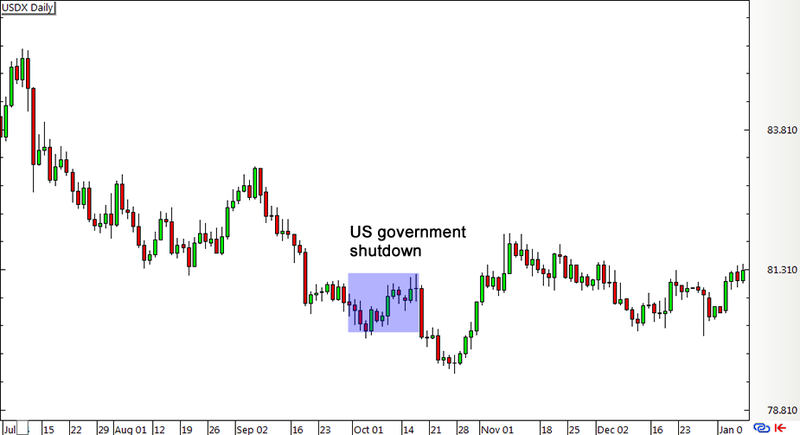 Meanwhile, the U.S. currency weakened against most of its forex rivals when the government managed to avoid a shutdown in 2011. Another way to look at it could be that traders dumped the Greenback due to the approved government spending cuts then, as this would also weigh on the country’s GDP. Other forex gurus say that the impact of a government shutdown on the dollar’s price action could mostly depend on how the U.S. economy is faring, with the Dollar Smile Theory likely playing a role in determining whether the Greenback reacts to fundamentals or market sentiment. How do you think USD will react this time?